I have to say I'm soooo excited because my new makeup look, a 60's inspired look, that Makeupbee posted on their Facebook page, reached over 500 likes and over 130 shares in just one day. Isn't that cool? And this is the full sized image. The most popular question about this look was regarding the lipstick, so if you were wondering, I used Make Up For Ever Rouge Artist Intense No.36 and on top of it I applied a touch of clear lip gloss. On my lids I applied a gorgeous LIT glitter in 'Champagne Wishes' over a white base. I had to share it with you, because I'm soo happy. Hope you enjoyed the look. And thank you guys for supporting my work, thank you for your likes and shares, it really means a lot to me. I'll be back soon with some of my recent work, if you're interested to see. 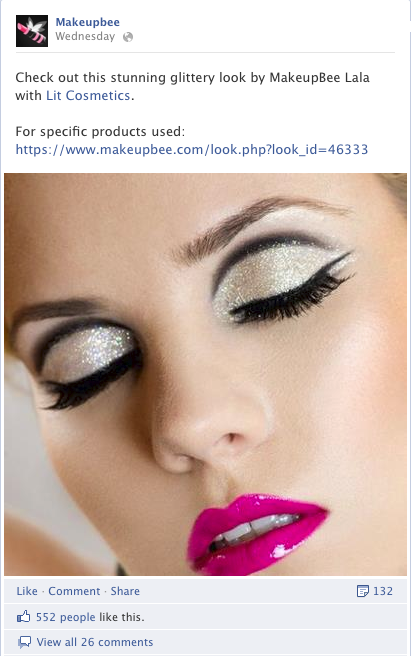 Search for Makeupbee on Facebook and you'll find me on their page. :D kisses. Kisses and love, thank you for your support.